Finished up softball for the year, and it will be interesting to see how I feel about playing next year. I played twice a week for 6 months, and the passion is not there anymore. I really think with Kyle's little brother or sister arriving soon I might not want to play as much. For you Phats ... VTFU. Some wit from Brad Pitt, one of my favorite actors: "I understand hand dryers are more eco-efficient than paper towels, but what happens when you want to rinse your face? What is one supposed to do?" The new TV season has started, do you have any favorites yet? Mrs. Shife and I enjoyed 2 Broke Girls and Up All Night. Tank Tank is now one of Blue's Buddies. Blue Buffalo puts these trading cards in the bottom of their dog food bags so I hope someone gets a kick out of his card. Me and the family are heading out of town so no new blog update next week. Don't miss me too much, but for the love of fat bassets I will miss you a lot. Finally, I would like to say thank you to my wonderful wife for the greatest years of my life. We will be celebrating 7 years of awesomeness this weekend. Take care my friends, and have yourself a great weekend. 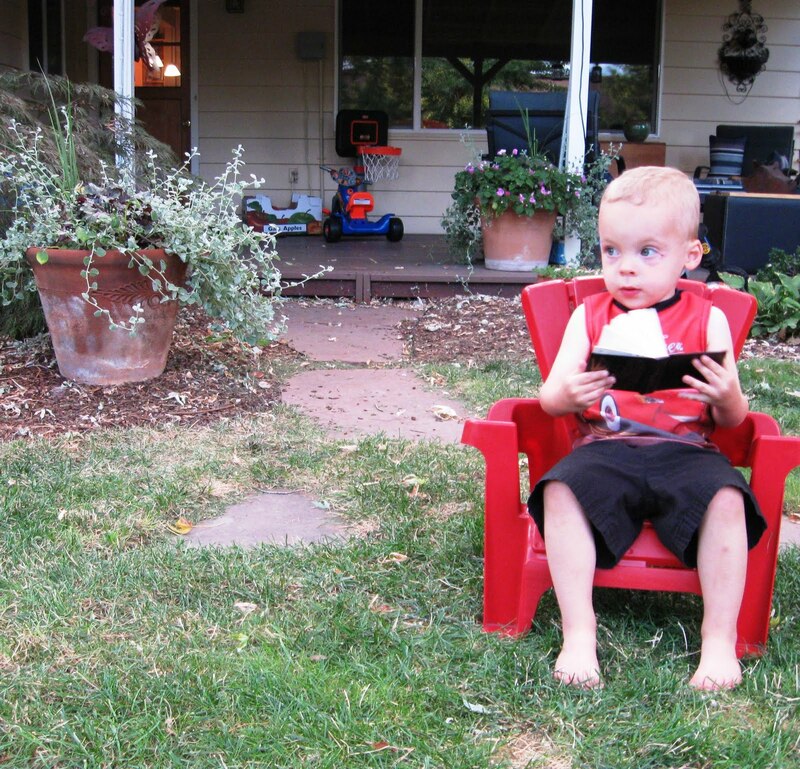 Also, below you will find a picture of my little man sitting in the back yard enjoying his book of Slovak poetry. I swear to you that is what the book is all about, and for some reason he loves to carry that book around. Thanks Kylie. The little man is the one who makes it look good. Over here we have hand dryers that tilt up so you can dry your face. I never use them, they play havoc with the hair style. Love your message to your lovely wife, and the expression on Kyle's face blows me away. He's a budding avid reader by the looks of it. Hope you have a great time on your anniversary. Love the pic. He's gonna be a reader. My Lord but that boy is growing up so fast! Happy Anniversary, Shifes! May you love forever and ever. Colin has that exact same chair is his room. Same style, same color, and he uses it as his reading chair. Enjoy the time away and congrats on seven years together. i tried to watch the office but only lasted about 10 minutes. That boy is going to be a writer! You can bet I will be looking for the Tank card! How cool is that! Happy anniversary to you both. I hope its a great trip. So far I haven't seen much of the new but am looking forward to a few that haven't started yet. We don't get those shows that I know of, but I will have to look. My wife and I are celebrating 7 years of awesomeness too. We've been married 27 years but only 7 of them were awesome. Happy Anniversary to your and the Mrs! I imagine your son loves that book because it's fun sized, just like him and easy to haul around. I like Up All Night too. Saw the new Kutcher'd up 'Men'. Liked the first show but missed the 2nd. And glad to see Parenhood back, one of my favs. Enjoy your week off. Happy Anniversary to you and the Mrs. 7 years? Really? When I first started coming to your corner of the blogosphere, I think you were newlyweds.